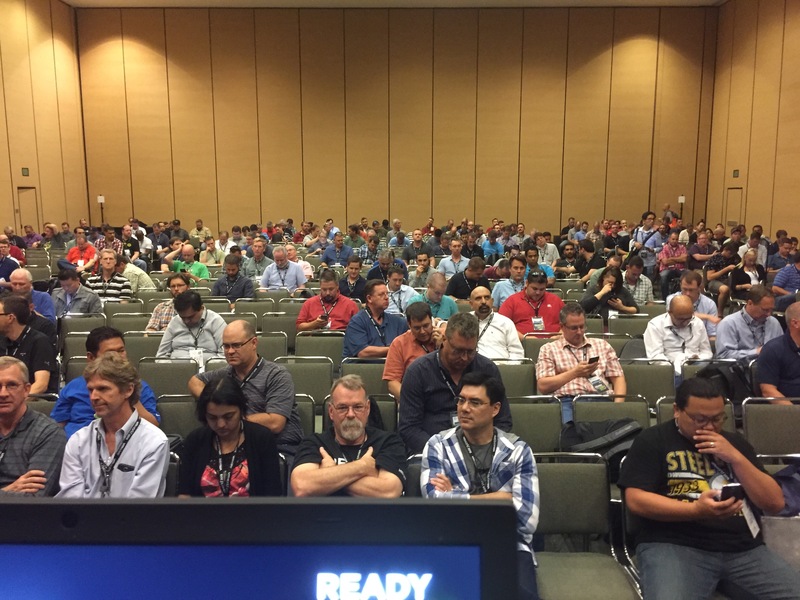 I have written previously about my session being accepted, but now that I have presented I want to recap my experience being a speaker leading up to and during VMworld. Title – this needs to be attractive to VMworld and to the attendees, you can also choose words to be towards the front of the voting list. Abstract – Same as above without any character optimizations. There is a word limit so it needs to be succinct yet exciting. Takeaways – This list is not shown to the public but it helps the organizers understand what your session is about. It also helps the speaker expand into an outline and generally stay on message. I was able to crank out an abstract and an outline in a few days and had my boss approve it. No legal or public affairs review yet. On 5/14 the abstracts were made available for public voting. Anyone with a VMworld account can vote for any number of sessions. I believe this information is used by the VMworld teams to select sessions but it’s probably just one of many criteria used. I don’t know the criteria for selection, but my guess is that they want to emphasize the ‘hot products’ like VSAN and containers, tried and true sessions like PowerCLI with Luc Dekens and Alan Renouf, highly voted sessions and customer/case study sessions. The day before the ‘official’ reveal date (6/12) The Twitter-sphere started to get word of accepted sessions. Apparently you could go to the speaker resource center site and see if your session was accepted (I had not saved this link and it was no longer available from the main page so I had to look through some emails). I guessed that I had a better than normal shot of getting accepted. You don’t see a lot of customer sessions, sometimes a consultant that doesn’t mention the name or a company that is well known. Big companies don’t let their name be used an endorsement for free or if it’s not for a specific publicly gain, thus the lack of customer sessions. So if I submitted a lessons learned session on my company’s deployment, It probably has a good chance. Once I saw that my session was accepted (6/11), I was really excited. Being a speaker at VMworld is a real honor, and I wanted to really share my experience and help others. In the speakers resource portal there are FAQs and different tasks and due dates. Some of the tasks are for accepting the speaking engagement, onfirming what type of AV setup you need, distribution preferences and feedback preferences (do u want it or not). I could have chosen not to receive those feedback forms (since I don’t think I will be repeat presenter), but in the end I decided to get the feedback. At around 6/28 the same time the content catalog came out and the early ‘top sessions’ came out. I actually made it onto Jason Gaudreau’s top 50 list , which was quite surprising. The lists usually go for the new hotness or really popular speakers. Around 6/30 I received an email that I could register for VMworld. I expected a registration code but instead the add a discount that is equivalent to the full conference pass price (seen upon checkout). I saw some rumblings on Twitter that some presenters only got say passes for the day(s) that they were presenting. I’m not sure if the rules for partners and consultants are differently, but customers get a full pass if they present at least 50% of a breakout session. I set out to finish my presentation quickly so that I could complete all the internal review processes for external presentations. For VMworld, they present in 16×9 so I had to find my company’s widescreen template. Then I banged out the presentation using my outline and some materials from the project deployment. Lastly I got the internal checklist filled out and submitted my presentation for internal review (July 3rd). Over the next two weeks my compliance contact cleaned up the presentation to ensure that trademarks were referenced properly, that it wasn’t name dropping too many products (so as not to endorse), and that it wasn’t too specific about our infrastructure. On 7/20 (the day before first draft submission), the presentation was approved by public affairs and legal! I really thought it would have been eviscerated, but it wasn’t too bad. I think since I focused a lot on processes as part of the lessons learned I was spared the red ink. The day the first-draft was due, Schedule Builder went live and I found my session was scheduled for 430-530pm on Monday 8/31. The session showed up as Orange on my schedule and listed as ‘speaking’. 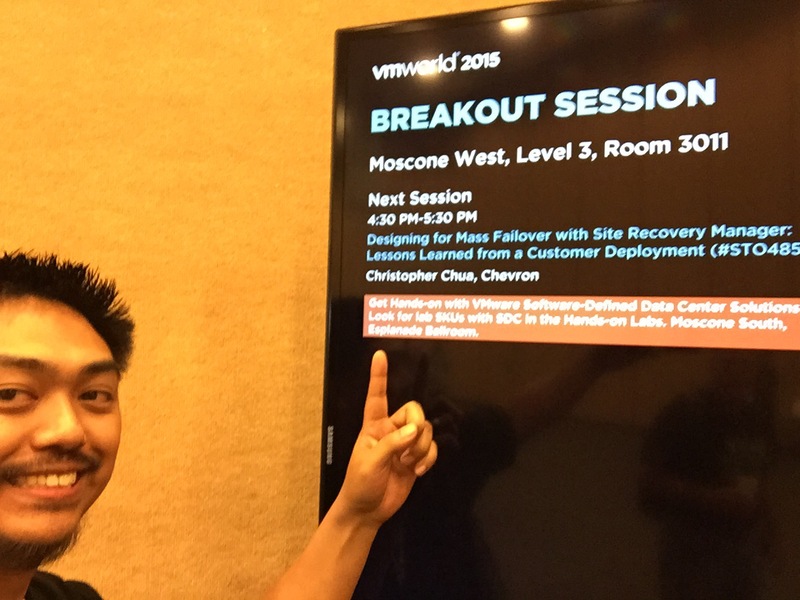 I started to build my own schedule and noticed that the popular VMware Workstation session was back-to-back with my session. Why is it so popular? Because they tend to give out licenses to the soon to be released Workstation product. My own co-workers said they would be late to my session. I also noticed that I overlapped with a William Lam session, and a Log Insight session by Steve Flanders, both sessions I would have liked to attend. From schedule builder I could only see the amount of seats remaining. I got a tip a few days later that from Speaker Resource Center you could see the total number of registrations as well as the company/role/country of the registrants. After a week or so, the session ‘sold out’ with a maximum of 207 registrants. A lot of people from the US, some Canada, a few Latin America and a few from Europe. The session was moved up to a bigger room twice, with 353 people registered out of a max of 463. After submitting the first draft, I was expecting some sort of feedback or something to make my effort to push for the first draft deadline worth it. What I got was nothing. I may have got an acknowledgement e-mail that the draft was submitted, but I think my memory is just being rosy. I did receive notification that the Final Draft deadline was set for 8/6. Since I didn’t have any comments, I did another pass through the presentation and pretty much re-submitted it as-is. A week later I received an email from the original PM that asked that I submit an abstract. He had looked through the presentation and made a few positive comments. I checked in with the AV tech who mic’d me up and set up the slides. I walked to the front past all of my coworkers and got the heckles. The hard part was waiting for the session to start and to fill. The room wasn’t packed but still a good turnout for the last session of the day. There were 434 pre-registered attendees and 292 who attended .This was a picture from a few minutes before start. The presentation went quite smooth, I missed some small things that I always forgot and I may have said a location that I shouldn’t have. Overall I was happy with it, and the best of all I had 8-10 people ask questions. They were all good questions that also validated my work (from those with similar expwriences). I got some good tips from their experiences that I can factor into our deployment. Some also stayed around after to talk, including one of the SRM engineers. From those who asked questions and my colleagues they said it went well, it didn’t drag and I maintained the audiences attention. I also looked through some surveys (you can see these right away) and I had generally positive reviews from the 28 respondants. One area that was ‘weak’ was audience engagement which makes sense, I don’t poll the crowd, just drop the knowledge. For me it seemed to align well. Classify your session correctly for the amount of technical information. I was right on the money with a “technical” presentation, even those who scored me low (2) said that it was classified right. Time your session from the moment you create an abstract. Once I had an abstract, I created an outline and determined how many slides that would need. Rule of thumb is 2-minutes per slide and the conference wants 45 minutes of presentation. Determine the tone but realize it’s going to be dead quiet. I tried to be jovial or snarky in a few areas but I didn’t get as much as a snicker. You can easily get discouraged from a planned joke that falls flat, so keep it in mind and keep going. Determine your audience engagement strategy. I didn’t want to poll the room since that seemed a little marketing-ish, but if I did I think my engagement would have been higher in my feedback. You have to weigh these ‘raise your hands’ questions with if it fits with your tone and style of presentation as well. Look at different parts of the room and don’t fixate on one person. This increases the feeling in the audience that you are engaging them instead of staring into the presentation. Practice in the same conditions as your presentation. This means a podium with a laptop and a clicker. I was thrown off by the setup because I had not rehearsed how I would stand, how far de the podium I would stand and whether to use a clicker or advanced the slides on the keyboard. I started with the clicker then realized it wasn’t as comfortable so I went to the keyboard mid-way. My slides were heavily text based so I needed to be close to the podium since I wouldn’t be able to read it from far. Distancing myself from the podium could have increased engagement as well. Include all relevant links, blogs, Twitter, and contact info in the slides. VMworld removed my questions slide for some reason and I didnt bother putting it back in. Unfortunately that was where I put my contact info. I was a little restricted with the blog links and social media handled by my company, but it would make things easier for the participants. Also have a few business cards in case people approach you off the stage, that increased the connection vs having it on the slides. If you have questions have people go to the mics so everyone can here and so that it can be recorded. Also manage the time of each question. I had one person who had great comments but he ended up setting up a conversation between us. Not fair to the people waiting so find the opportunity to move to the other people. Work on the verbal tics such as ‘um’ ‘uh’ etc. Knowing the material helps avoid this but when Infelt myself slipping I pause to let my brain and mouth synch up. Practice, practice practice. The more comfortable you are with the material, the more confidant you will feel and the more knowledgable you will come across. A side effect of the abstract submission through presentation process was that I started to think about VMworld back in April when abstracts were due. Usually I don’t think about the conference until registration opens in June, so this year a lot of the energy was spent up front. In July, I was already feeling like VMworld should already be around the corner. I kept feeling like announcements were not being made or were just really late, but in reality they were done during the same time that they were last year. The motions of the session process got me out my normal day-to-day routine, which was a good thing. It was a nice break from my day-to-day work to focus on a presentation versus purely technical back-end work. I also enjoyed the fact that I was able to successfully get this presentation through our compliance/public affairs/legal review. That’s a gauntlet of approvals, but I was working with some good people who understood that I needed to have some technical details to make the presentation work. The hardest and most rewarding part was the presentation itself. I was really anxious beforehand but I got through it and Infelt like I didn’t steal or result in fillers like ‘uhh’ between sentences. I only lost a handful of people so it wasn’t a total bore and I started questions at exactly 42 minutes well eithin my rehearsal timing. The questions and ‘good session’ comments I received after were reaffirming as well. Hopefully I have an opportunity to present again, it was a very unique experience. nice write-up about all your experiences.